Say helloooo to my new favorite summertime dessert! 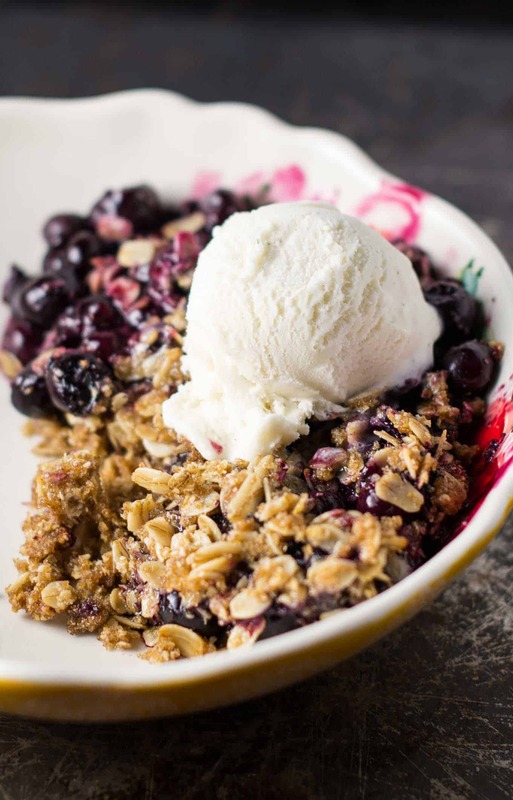 This vegan blueberry peach crisp is everything I love about a good dessert: it’s healthy-ish, not difficult to make, and pairs perfectly with a scoop of vanilla ice cream. I’m always down for a bowl of crisp with ice cream! 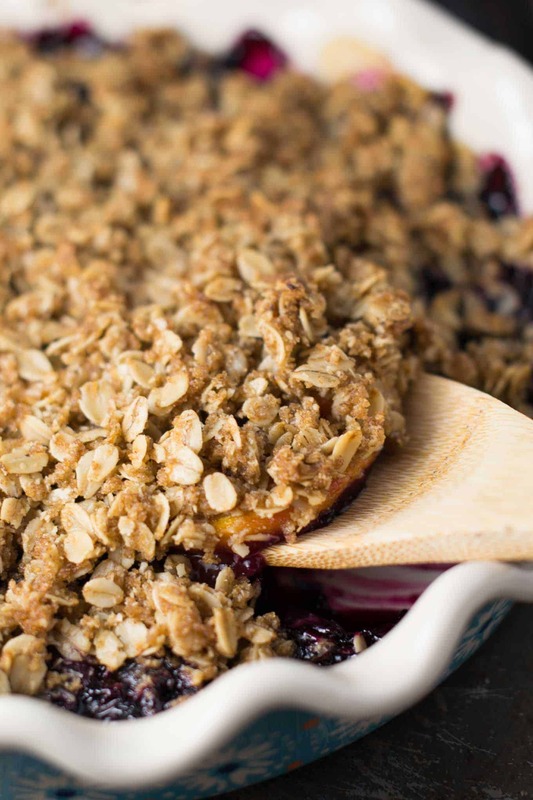 If you can’t tell from my best vegan apple crisp, strawberry crisp, cranberry blueberry crisp, or easy peach crisp, I think it’s safe to say I am in love with crisp recipes! I love how simple they are to throw together, and the oven really does all of the work for you. First up, here are the ingredients that you need to make this recipe. 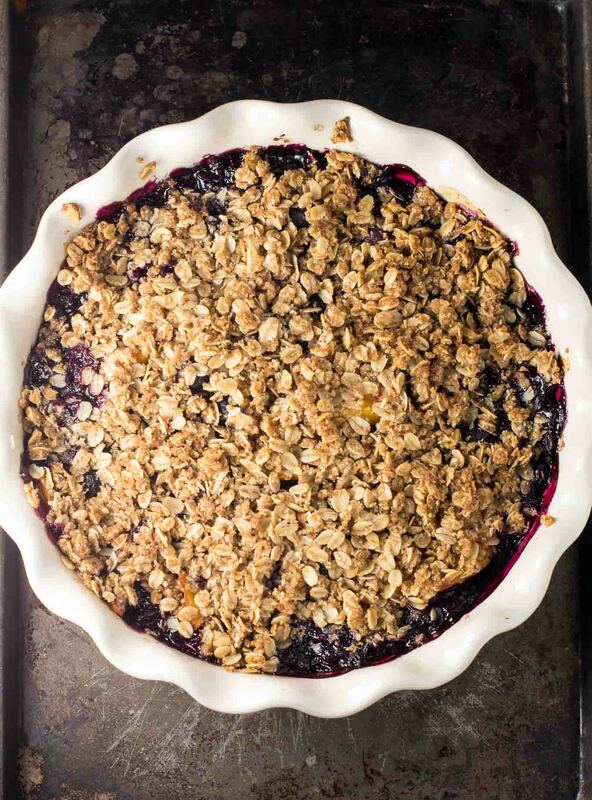 The crisp topping is made with a mix of oat flour and rolled oats, making it gluten free. It still has great texture, but like most crisp recipes, is best served fresh. Fresh crisp from the oven = melt in your mouth fruit with a crunchy crispy topping. Soooo good. My husband’s all time favorite dessert is my vegan apple crisp recipe. It’s a classic favorite of ours every fall and we love it. 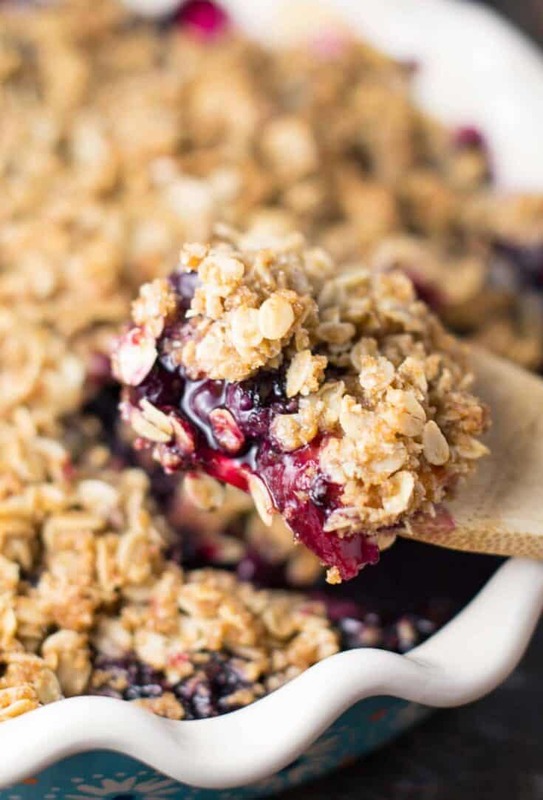 While that recipe is fantastic, I wanted to create an easy berry crisp recipe that could be throw together in minutes without a lot of time spent chopping up fruit. This is a great summer dessert for when you really don’t feel like spending a bunch of time in the kitchen. Even someone that doesn’t like cooking can make this recipe fast! Sometimes you just need a quick and easy dessert, right? This would also be a great recipe to use up extra summer produce year round. If you have extra fresh peaches or blueberries to freeze, just store them until you are ready to use them. Stock up during the summer if you want that super juicy fresh peach flavor. I’m a frozen blueberry lover myself, so I’m glad that those are always available to me. Am I the only one that likes frozen blueberries better than fresh? My husband seems to think so. Random fact: frozen blueberries are one of the only things that immediately cures my stomach ache. If I eat a bowl I almost always feel better within just a few minutes! See my 15 Easy Vegan Desserts roundup for more favorite recipes! 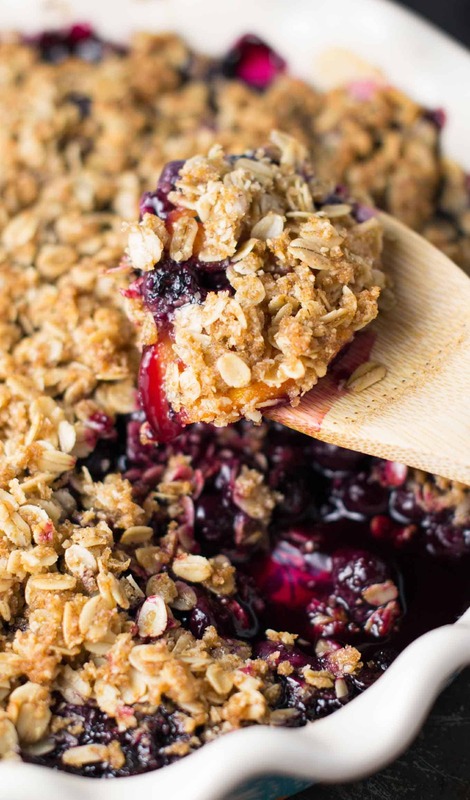 I use both frozen peaches and frozen blueberries for this easy vegan blueberry peach crisp. 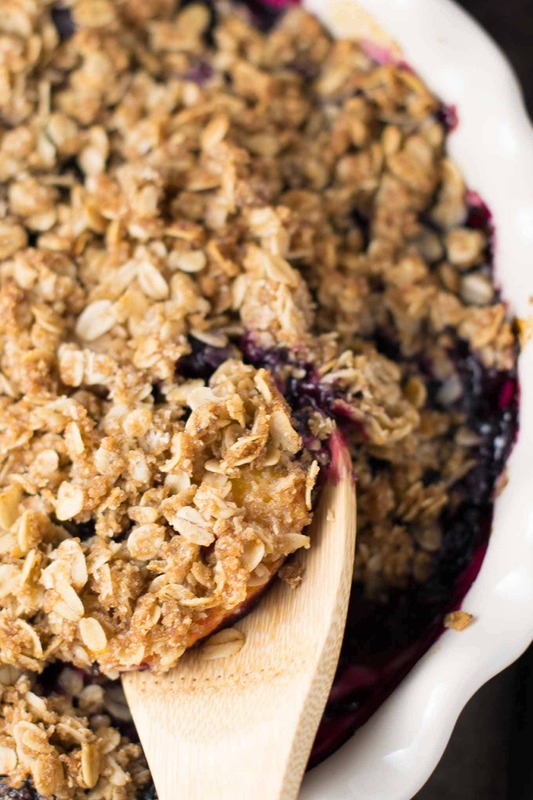 This recipe is similar to my easy peach crisp recipe, but I made the crumble topping to be gluten free so that everyone can enjoy it! Blueberries are one of my favorite fruits and add such a nice sweetness to this dessert. Even though I love frozen blueberries, I also love them all bubbly and warm in this crisp. 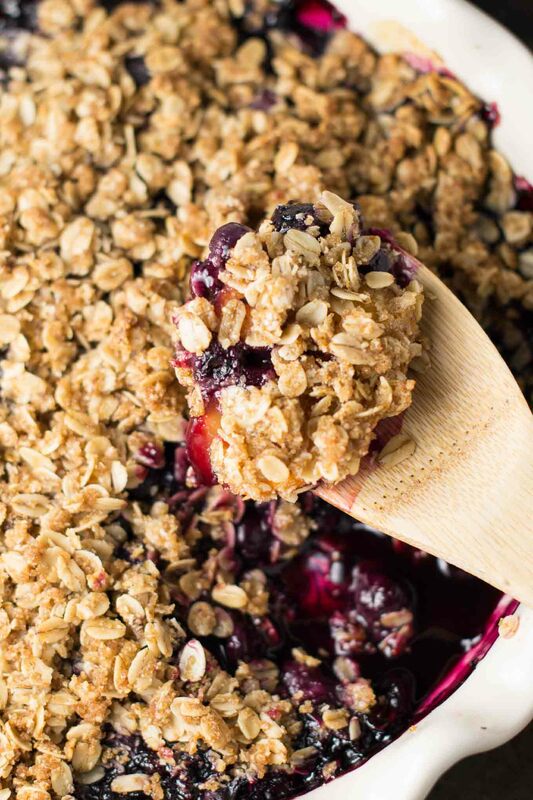 There’s just something so comforting about a big bowl of berry crisp! While I admit that fresh peaches usually have more flavor, I still loved the flavor of frozen peaches once they cooked! If nothing else, it saves a ton of prep time. And I’m all for an easy and satisfying dessert that doesn’t take me a ton of time spent in the kitchen! This recipe is gluten free which is a plus if you know someone that can’t tolerate gluten! I have made this with gluten free relatives in mind. 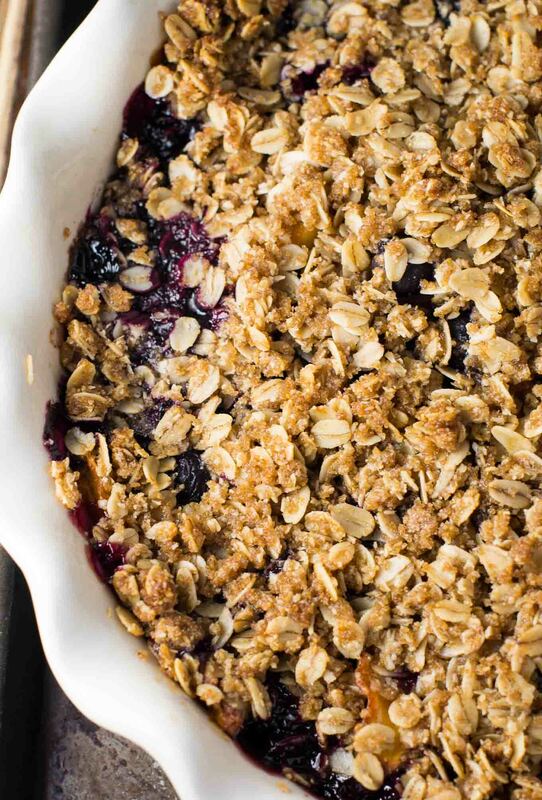 While nothing can quite top apple crisp in Robbie’s eyes, this blueberry peach crisp was a VERY close contender. Hungry for more? Here are some more crisp recipes to try! Juicy, sweet, healthy-ish, and perfect with a cool scoop of ice cream. Now that’s what I’m talking about! Check out these vegan dessert recipes! Here you’ll find tons of my favorite vegan desserts! Are you making this recipe? I want to see! Be sure to tag me on instagram @buildyourbite and hashtag #buildyourbite. The crisp topping is best served right away. Leftovers will not be quite as "crispy", but still delicious. Made this today and it baked while we ate dinner. We ate it warm a couple of hours later…delicious.! Thanks for posting. My husband is low fodmap and gluten free and he really enjoyed eating something that was just like what I always made prior to his illness forcing the dietary changes. I didn’t have any oat flour, I usually grind gluten free oats in food processor unto powdery and proceed with recipe. I skipped the peaches too, he cannot eat those on his diet. It was easy to make and very good, will make often . So glad to hear you enjoyed the recipe Ellen! That’s awesome that you are finding ways for your husband to still enjoy the foods he loves! excuse me , but it is not vegan if when it includes butter.otherwise, beautiful recipe! The recipes calls for vegan butter, it is vegan 🙂 I use earth balance buttery spread, but any vegan butter will do. Is it possible to just use all coconut oil instead of the extra 1/4cup vegan butter? I haven’t tried it but I think it would work, let me know if you try it! This is AMAZING! We recently had to switch to a gluten-free, dairy-free (bye, bye ice cream), and egg free diet due to my daughter’s food sensitivities. She was so upset that she would have to give up baked goods (esp, since I love to bake) – this was a knockout recipe! I baked and wrapped in tin foil – it was still warm when we had it several hours later. She even had a 2nd helping for breakfast the next day! Thanks so much for a great recipe – I will definitely be checking out more of your blog. I’m so glad your family enjoyed the recipe Sue! Yes, I have lots of gluten free dairy free desserts on here! This was very very good! The ice cream or cool whip is totally unnecessary. I used fresh blueberries and no peaches. I plan on using this recipe with other fruits. I’m going to see what you have for main meals; I like/appreciate the idea of gluten free and vegan. So glad you enjoyed the recipe Jeannette!